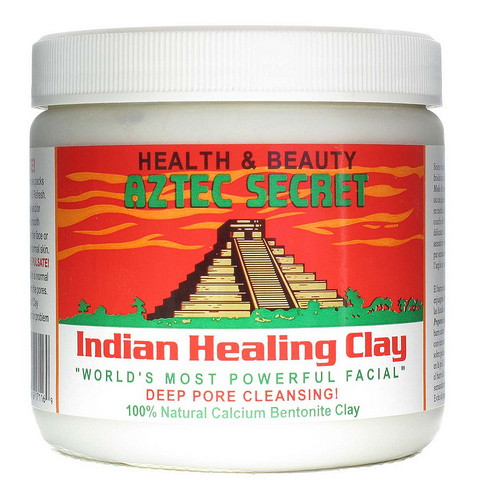 AZTEC Secret Indian Healing Clay offers bentonite clay from Death Valley, California, where it is sun- dried for several time in temperatures that sometimes are over 130 degrees. The company is practically a shadow, I would say web-based and has no quality certifications to validate the procedure of the unique main ingredient. However it’s a popular mask, so time for a review! Not a fan of the cheap jar packaging. Well actually is just one: CALCIUM BENTONITE (green clay), however, the truth is that bentonite clay really can help clean the gunk out of your face. Not sure if it’s a premium kind or the cheaper one. But considering the price, I think it’s the cheaper one. The most common usage for this AZTEC Secret Indian Healing Clay is by mixing it with apple cider vinegar because of vinegar, which is very acidic, this helps neutralise the pH of the clay but just apply it once every fifteen days on the face and back. I use this clay mixed with yoghurt, honey or turmeric and leave it on my face and back for 10 minutes the most. Would preferably not use vinegar. When I use it once I do it always at night and left it on for no more than 10 minutes always. Skin gets a bit red and sensitive after, but nothing that a little moisturiser can’t fix. 10 minutes is enough to read a portion of a good book or do something relaxing and let it do its work. Most likely after removing it your face will be red as a tomato, but after the redness faded the complexion will look so much better, your skin pores smaller afterwards. It is inexpensive and you can find it at many local beauty stores. Yes it tightens your pores, made skin feel clean and the jar will last forever, BUT it made my skin really red after (fades after 30 min but still) so I don’t recommend you to use it on a Friday if you going to a party. I give to this 3 star out of 5 not because is not good, it is because it has not been properly developed, I can not use at my clinic. On the other hand, with $ 11 USD its cheap and you can give it a try, although I would recommend a product which is pH-Neutral and adapts better to the skin.